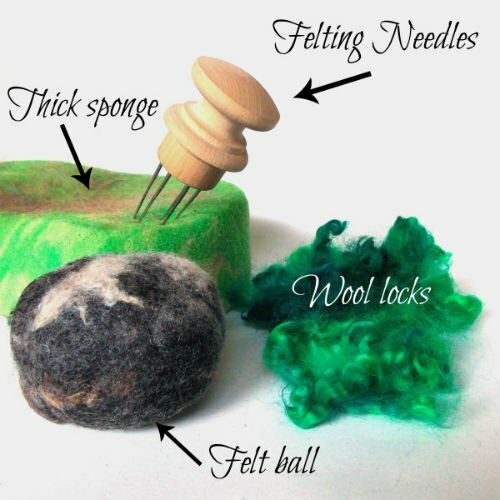 DIY Felted Pincushion - Great Gift Idea! You are here: Home / Crafts & DIY / DIY Felted Pincushion – Great Gift Idea! 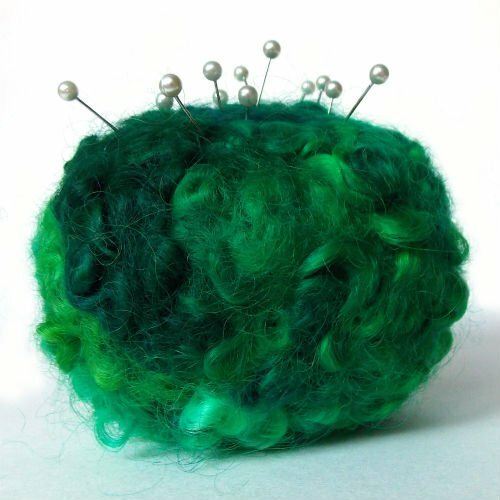 DIY Felted Pincushion – Great Gift Idea! Yes, the gift giving season is almost upon us again! Can you believe it? Well, years ago my friends and I decided that instead of buying each other stuff we don’t need, our gifts would be handmade. Honestly, it’s been a lot of fun! Is there a needleworker or seamstress in your circle? How about making him or her a custom needle felted pincushion? Felting Needles are WICKED SHARP! Be super careful when using them! This is not a time for multi-tasking so don’t do this while watching TV. Also, make sure to keep them away from children. Place your dryer ball on top of the sponge to keep the needles from poking through and hurting you. 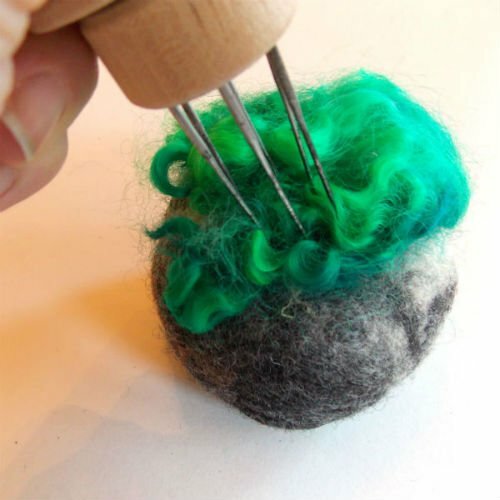 Take a few of the wool locks and lay them on the felted dryer ball. Carefully begin poking them with the felting needles into the ball. Repeat stabbing and poking until the locks are firmly attached. 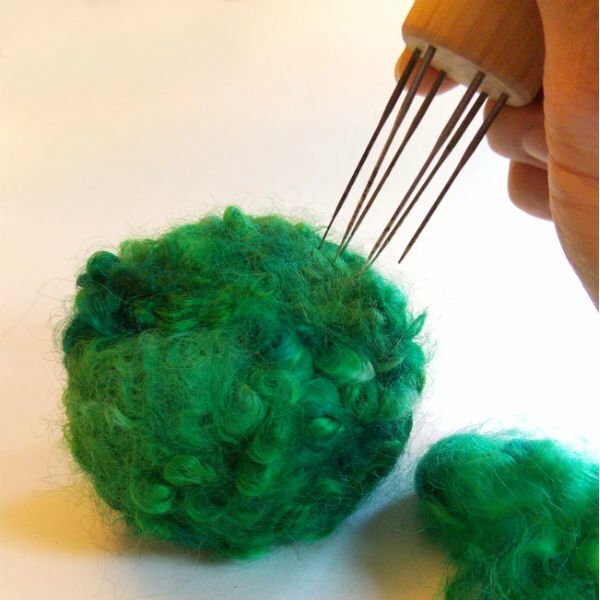 Continue adding fiber, needle felting, adding fiber, needle felting until the entire felt ball is covered with fiber. That’s all there’s to it! You can also needle felt your pincushion with roving instead of locks for a smoother finish. Enjoy! Want more Needle Felting Fun? This is such a great gift idea! I think I’ll make one of these for my MIL for Christmas! My family opts for homemade gifts every year as well and this would be perfect for my aunt who’s the quilter in the family! Love it! Very cute! I love homemade presents, they are so much more fun than store bought! I am in love with that colour! This would make great gift and it looks fairly simple to make. Thanks!